Earlier this month, I told you that the month of April actually has two birth month flowers, the Daisy and the Sweet Pea. At that time, I shared information about the Daisy, but now, it’s time for the Sweet Pea! The Sweet Pea is a delicate flower that gets its name from its sweet fragrance. Derived from the Latin “Lathyrus odoratus” meaning ‘pea’ and ‘fragrant’. It is commonly available from March to November, with more limited availability through the winter, most of the time depending on Mother Nature. Because the season really takes off in March, the Sweet Pea is a popular Spring flower and adds a feminine and delicate touch to bouquets and centerpieces! 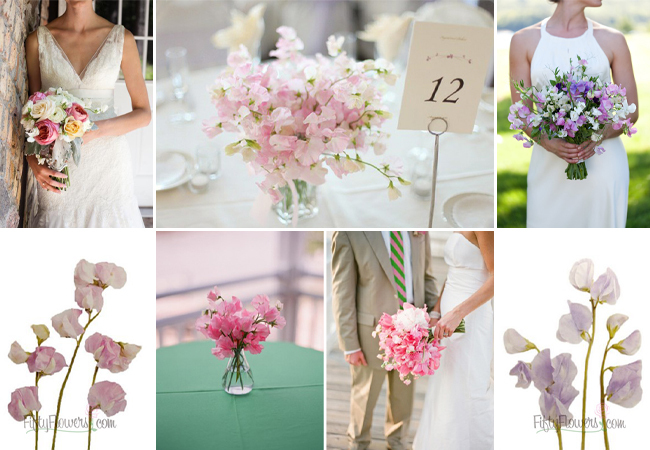 Sources: Clockwise from Top Left: FiftyFlowers Testimonial, Sweet Pea Centerpiece, Sweet Pea Bouquet, Lavender Sweet Peas, Sweet Pea Bouquet and Centerpiece, Light Pink Sweet Peas. As you can see, Sweet Peas range in colors from soft pastel pink to a lavender purple. You can see all the Sweet Peas we have to offer, Here! Sweet Peas are packaged in 25 stem bunches and are available in 7 or 15 bunch boxes. Each stem will have an average of 3-5 blooms. The Sweet Pea is said to represent ‘delicate pleasures’ and is sure to bring a delicate touch to any arrangement! Because Sweet Peas are delicate, you will receive an extra bunch or two to account for spoilage. Also, we normally recommend using big buckets to hydrate your flowers, however, because Sweet Peas are smaller and more delicate, smaller vases or buckets should be used so your flowers do not get smashed or fall completely into/under the water. Fill containers with a couple inches of fresh, cool water. Using sharp scissors or a knife, cut the stems diagonally under running water approximately an inch from each stem’s bottom edge. Wild Sweet Peas are known for their poisonous seeds. Play it safe; do not use this flower in food or beverage decorations. Be sure to call 1-877-507-6737 or chat in at FiftyFlowers.com if you have any questions about the flower care or about designing of your flowers! What’s NEW and Exciting at FiftyFlowers? … Take a look!